A 3D Image of New Zealand Defence Force’s new fleet tanker. New Zealand’s new fleet tanker will be powered by CODLAD propulsion system developed by Rolls-Royce. The replenishment tanker has a design displacement of 24,000t. The New Zealand Defence Force’s (NZDF) future ice-capable fleet replenishment tanker is scheduled to be delivered in January 2020. It is being developed by South Korean shipbuilding company, Hyundai Heavy Industries (HHI), under the Maritime Sustainment Capability (MSC) project. The MSC project is aimed at replacing the Royal New Zealand Navy’s (RNZN) ageing HMNZS Endeavour tanker. The new vessel is intended to strengthen NZDF’s maritime replenishment capability at sea by supporting the nation’s naval combat force and its partner countries’ ships. The tanker is also suitable for a number of missions including logistics support, maritime sustainment, humanitarian aid, and disaster relief. The Government of New Zealand approved the MSC programme for the New Zealand Defence Force in June 2014. A tender for the same was released in March 2015. 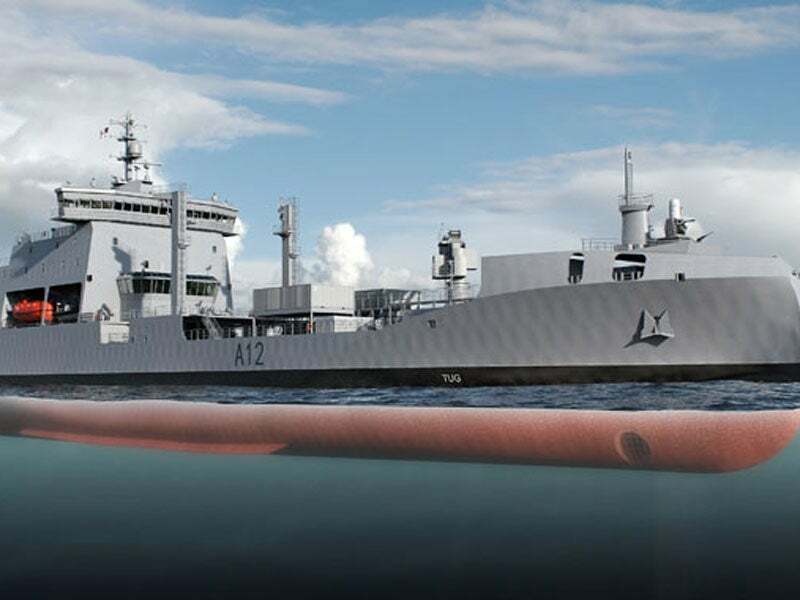 HHI was selected as the preferred bidder for the design and construction of a naval tanker in December 2015. A prime contract worth $493 million was awarded to HHI in July, for the construction and delivery of the tanker. Rolls-Royce was contracted by HHI in September 2016, to provide Environship concept design, propulsion system, propeller shafts and electric power systems for the new vessel. Keel laying ceremony of the vessel was expected to take place in September. The ship is expected to be inducted into the RNZN by March 2021. Designed to Polar Class 6 standard, New Zealand’s future fleet replenishment tanker can operate in Antarctic waters. Its hull form will be based on a modified Rolls-Royce Environship Leadge Bow concept. Use of high-grade steel plating in the vessel’s superstructure will ensure resistance to cold temperatures and ice corrosion. The vessel will have an overall length of 166m, a beam of 24.5m and a draught of 8.5m. Two J3 rigid-hulled inflatable boats will be carried on either side of the ship to conduct a variety of missions at sea. Located amidships, two NATO probe electric replenishment / fuelling-at-sea (RAS / FAS) rigs will allow the ship operators to replenish / fuel two vessels simultaneously. Ballast heating systems will be installed on both sides of the ship to allow operations in low temperature conditions. With a displacement of 24,000t, the fleet replenishment ship will accommodate up to 98 personnel including 64 core crew members, 14 trainees, 11 flight crew, eight mission teams, and one VIP. Additionally, the vessel will carry two-berth clinical ward and treatment room with medical equipment. The fleet tanker can store more than 8,000t of diesel fuel, 1,500t of aviation fuel, and 250t of fresh water. It will be fitted with a desalination system capable of purifying 100t of fresh water a day. The vessel is capable of carrying a maximum of 12 dry cargo containers, eight of which are standard containers and the remaining for bulk ammunition. It will be fitted with a winterised main crane with a lift capacity of 25t. The fleet tanker will have a helicopter hangar and a heated flight deck at the stern to operate and maintain a NH90 multi-role military helicopter. The flight deck will incorporate a heating system for safe operation. The ship has the provision to equip two Mini Typhoon light weapon stations on port and starboard sides and a Phalanx weapon system on the bow. RNZN’s new fleet replenishment tanker will be powered by a Rolls-Royce combined diesel electric and diesel (CODLAD) propulsion system comprising two Bergen main engines and four Rolls-Royce Power Systems’ MTU generator sets. Each engine will drive a controllable pitch propeller through reduction gears. The propulsion equipment will also include propeller shafts, bow thruster, rotary vane steering gear, rudders, switchboards, motors, and drives. The vessel can operate at a speed of 16kt. HEPBURN marine products and services have been meeting the needs of naval and commercial clients around the world for more than 40 years.